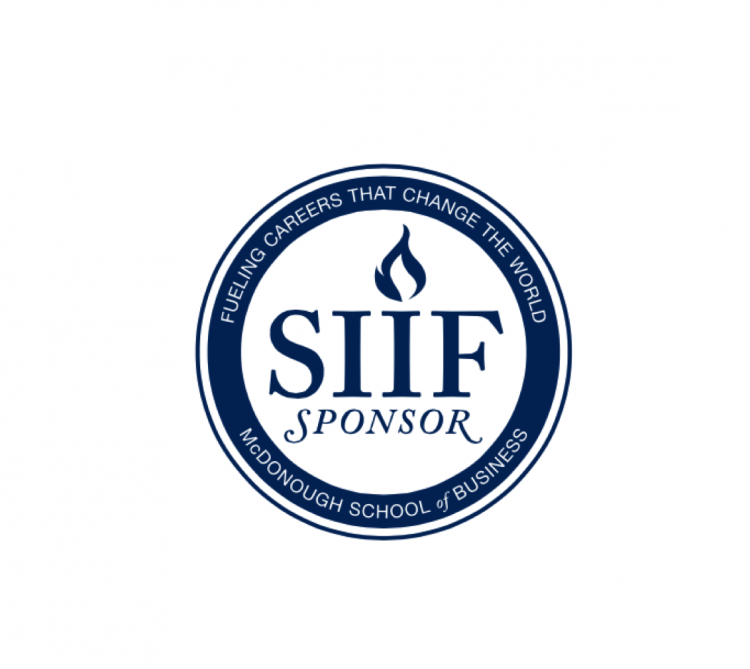 SIIF, which is run by the members of the Georgetown chapter of Net Impact, raises funds from MBA students by selling Kegs cups, renting graduation gowns and raffling prizes at events such as Spring Formal. These funds have historically been matched by the Dean's Office, but there is still not enough to fund summer internships at a level anywhere close to a typical MBA internship. To reduce the tradeoff between paying bills and doing good, and make McDonough more competitive against impact-minded MBA programs such as NYU Stern and Berkeley Haas, SIIF is humbly asking McDonough students to pay it forward as SIIF Sponsors. To be a SIIF Sponsor, all you need to do now is pledge 0.5% of your summer pay toward the SIIF fund for the incoming class. For a typical 10-to-12-week internship, 0.5% is roughly two or three hours of your time. You’ll be done by lunchtime on your first day of orientation! Plus, you get to make a social impact no matter what type of internship you choose. Everybody wins. Don’t have your internship lined up just yet? Short on cash? No problem. It’s the pledge that counts. We’ll collect the actual donations on OrgSync when you get back in the fall – hopefully with a checking account that is no longer crying out to the world in sadness. If you haven’t noticed, I’m pretty broke. Why are you asking me for money? Yeah, we’re pretty broke too. But without SIIF, many students who choose to work at a nonprofit or a microfinance startup would be super broke. This is our chance to show that McDonough students look out for one another and care about using business for the greater good. The team at SIIF is also working to secure matching donations from alumni to create a sustainable fund for the long haul, so that students don’t bear the burden. Is the donation on our before-tax or after-tax income? Such an MBA question! You get to decide. The donation form on OrgSync won’t care. What if I want to give less/more than 0.5%? Where will my money go? Will people know how much I made this summer? Our administrators, Angela Thornburgh and Mehtab Bakshi, will handle transactions with total confidentiality. People will know that you donated but they won’t know how much. Every dollar you donate will go to the SIIF fund. Nothing will be used for operations. "I pledge 0.5% of my internship earnings to the SIIF fund and will make my donation following my internship in September 2017"
The Become a SIIF Sponsor and Pay it Forward by Pledging 0.5% petition to Social Impact Internship Fund was written by Maddy Stokes and is in the category Business at GoPetition.